I’m a bit late to the party here, Spam Singles have been available for a while but I happened to notice them in the store yesterday and bought a couple on impulse. I don’t eat Spam nearly enough these days. Don’t get me wrong, as card carrying white trash I love the stuff, grew up on it in fact. And since I moved to San Diego and discovered the growing number of Hawaiian plate lunch shops I’ve come to love Spam musubi. But I hardly ever make it at home. Why is that? God knows it’s not because I have such a strict, healthy diet. No, it’s just that as a confirmed bachelor I can’t eat a whole tin of Spam in one sitting and it certainly isn’t something I’d want sitting on a Saran wrap covered dish in my fridge for a week. 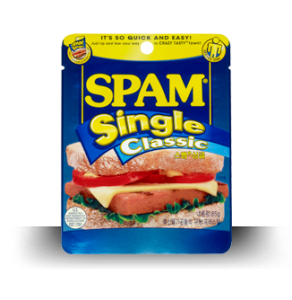 Apparently the good folks at Hormel drew the same conclusion and introduced Spam Singles, a single slice of Spam just the right size for a sandwich, packaged in an E-Z open foil pouch. Finally, I can eat Spam without the expense or bother of an entire tin. “Hey”, I hear you say, “it sounds great. But how does it taste?” Just what I was wondering. To find out, I decided to make a fried Spam and egg sandwich. One unexpected benefit: no need to slice off a piece of Spam. 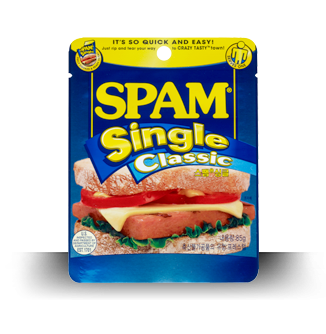 The perfectly sized Spam Single makes everything easy. And it tastes great, same great Spam flavor and texture. As for the sandwich as a whole, it was delicious. 5 minutes from start to finish for a tasty and semi-nutritious breakfast. Spam Singles retail for around a buck each. I have no idea how that compares per ounce to regular Spam but I do know this is how I’m going to buy my Spam from now on. It’s not often that a company updates a classic and makes a real improvement but Hormel hit the ball out of the park with this one.